A totally new model for 2017. The Oakley Double Edge is a high wrap frame with rectangular lens with optimized peripheral vision and side protection. Matte Tortoise with Prizm Tungsten Polarized Lens. Polished Black with Prizm Shallow Water Polarized Lens. Polished Black with 24k Iridium Lens. Matte Black Tortoise with Violet Iridium Lens. Matte Black with Prizm Ruby Polarized Lens. The Oakley Double Edge sunglass is a sculpture inspired by sharp angles, this double-edged approach to eyewear matches style with performance, and its self-assured look revels in originality while giving you an expanded field of view. 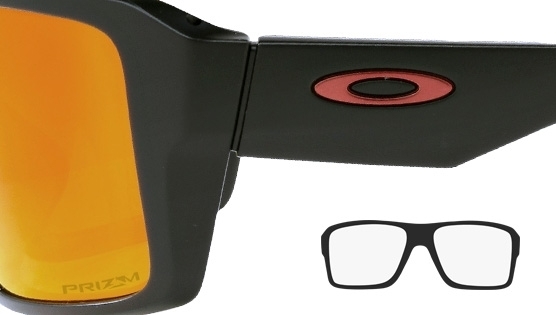 The Oakley Double Edge is a high wrap frame with rectangular lens with optimized peripheral vision and side protection. It's an ideal size for medium to large faces. Unobtainium® nosepads increase grip with perspiration for a no slip grip and the Three-Point Fit holds lenses in precise optical alignment while eliminating pressure points.